A technical paper, in PDF form, containing an algorithm with over sixty linear, nonlinear and integral equations is converted to a mathematical model in TK Solver and subsequently linked to Excel and a web application. The math model was completed in one day and the links and refinements to the interface were completed on day two. 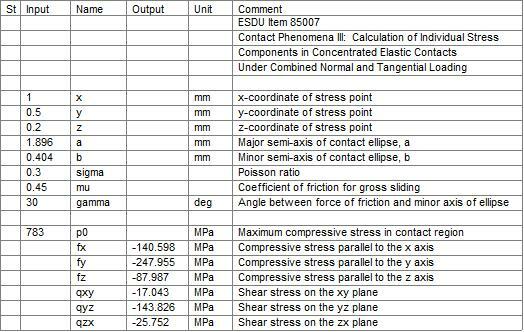 The technical paper was ESDU Data Item 85007, entitled “Contact Phenomena III: Calculation of Individual Stress Components in Concentrated Elastic Contacts Under Combined Normal and Tangential Loading.” It was made available in PDF form. The PDF file was briefly reviewed and it was noted that two complete examples were provided within the document, either of which could be used to verify a computerized version of the formulas and calculations. There are 57 such equations in the math model, in addition to several functions which were added to perform tasks such as generate plots. These will be discussed in more detail later. The variables in the equations are automatically summarized on TK’s variable sheet, including descriptions and units. Here is a portion of the variable sheet, with the inputs grouped at the top. The model also includes many auxiliary variables used by the ESDU algorithm. 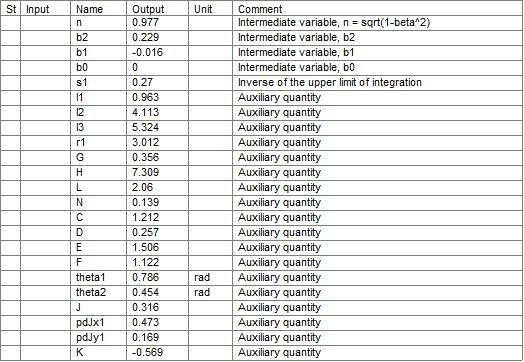 Those variables are grouped together on the variable sheet. During the testing of the model, it was very useful to be able to verify that each intermediate value was computed as specified by the paper. Here is a portion of that listing. The calculations required three numerical integrations. Fortunately, TK Solver includes built-in functions for those calculations. Here are the integrands. The limits of the integrals were determined from the solution of a sixth order polynomial. It was necessary to find all the roots and then use the largest real root in the upper limit of integration. 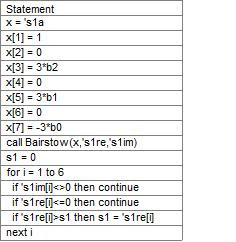 TK Solver includes a root finder that was perfect for the task, based on Bairstow’s algorithm for finding real and complex roots of nth-order polynomials. A loop was added to select the best one for this application. TK’s unique capability to mix rule-based equation solving with calls to procedural subroutines was a time-saver. Here is the procedure that sets up the polynomial, solves it with a call to the Bairstow function and then picks the best solution for the application. The model takes a fraction of a second to solve and the solutions verify the values from the example in the paper. The TK file was linked to an Excel spreadsheet, as shown below. There are several advantages to this. The underlying formulas can be hidden. The interface can be customized. The TK model can be used as a function within a larger spreadsheet application. The spreadsheet and model can be packaged together and shared with anyone. The spreadsheet dynamically updates as the inputs are changed. The plots were added by taking advantage of TK’s powerful “List Solve” feature to repeatedly solve the equations over a range of inputs for one of the variables. The TK Solver model was also processed using a UTS tool called Galaxy, which automatically builds a browser interface for a web-based application. Again, the variables displayed in the browser interface are dynamically linked to the model. There are a number of additional features of TK Solver that make it an excellent tool for such applications. Units management is one TK’s strengths. In this application, unit conversions are available for all the inputs and outputs. You can globally swap between US and SI units or mix and match as you like. This feature carries through to the Excel and Web interfaces as well. Table and plot generation is another asset. Any mathematical model built in TK Solver can be enhanced without any additional programming required. 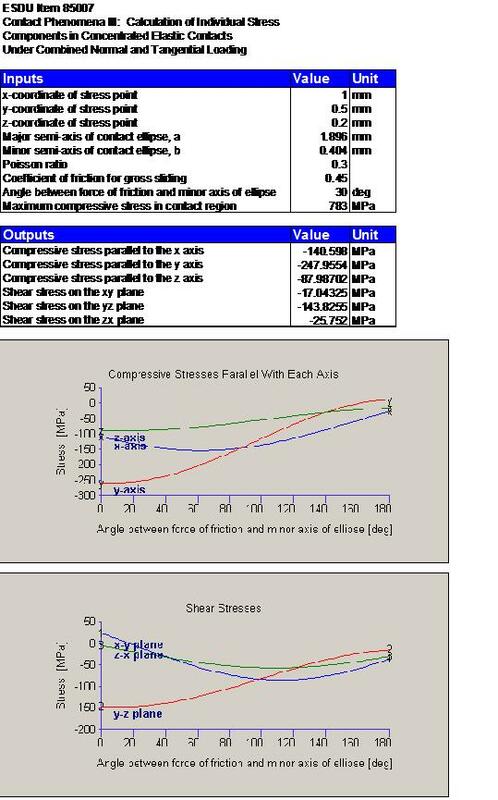 As shown, the effects of varying the friction angle are plotted and automatically updated as other variables change. Even the locations of the plot annotations dynamically change. Backsolving is perhaps TK Solver’s most valuable feature. Backsolving allows users to input a desired value for one or more outputs and solve for the required inputs. One example for this model would be to input a stress value and have TK determine the required friction angle or contact dimension. Here is one such example. Note that fy, the component stress with the maximum absolute value, has been input and the contact length, a, has been solved. In this way, a single TK Solver model actually solves much more than the initial intent of the technical paper, with no additional programming required. In summary, a technical paper containing dozens of pages of equations is now accompanied by a mathematical model that the reader can immediately use to solve any related problems. With much more functionality than FORTRAN or BASIC translations of the formulas could provide, the TK Solver model gives the reader a dynamic way of turning a complex document into a handful of variables that are easily understand and manipulated. Best of all, the entire process only required a couple days.